As far as digital marketing goes, in today’s Google-orientated, SEO-focused world, we know how valuable it is to find what we’re looking for -- and yet, site search is often overlooked in favor of what many think are more eye-catching streams of investment. Site search can reveal crucial insights into your customers’ behavior. This data, when used effectively, can be pivotal for your digital strategy. 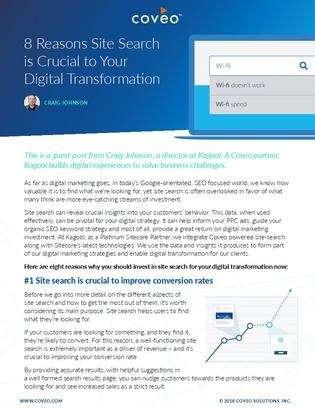 Download this white paper from Coveo to uncover 8 reasons why you should invest in site search for your digital transformation before it’s too late.